This Edu-Netbook *might* be the best yet. The Mirus Schoolbook Convertible looks like it’s a decent step forward in the design of a low-cost mobile computing device for education. Mirus Schoolmate convertible netbook/tablet: designed for learning. 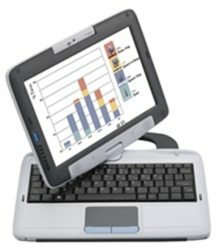 It’s a step up from existing netbooks and even the OLPC because it features a convertible design – the screen can be swivelled and locked flat so that it turns into a “tablet” computer, which responds to both the built-in stylus and to finger touch (like an iPhone). The design also features a liquid-resistant design just in case there’s an occasional spill or run through the rain – scenarios that are possible (or probable!) in a classroom, school yard, or school bag. Like most netbooks, however, this device doesn’t have a massive amount of processing power or hard drive space; but it doesn’t really need it for the tasks it would most commonly be used for: accessing web-based activities and resources, working on homework or assignments, reading ebooks and basic communications and connectivity. Indeed, having reduced processing power means it’s far less likely to be used for playing the latest computer games rather than used as a learning tool. After analysing the product features and reviews of it that are sprinkled across the web, I suspect that this device could be better in a classroom than any edu-netbook I’ve previously seen. The one specification that could probably do with improvement is the 5.5 hour claimed battery life. Some netbooks are now obtaining usable durations of 8-10 hours, and this would allow it to be used for a whole day without requiring a charge. All in all though, this is a most capably specified device – so much so that I’m considering buying one myself to try out more rigorously. We are planning a conference for MobilizeThis2010 in Darwin during late October this year. This will be the 5th occasion that MobilizeThis has taken place ! We’d like to invite you to join us as a ” Short Paper : Presenter” and if it’s possible to invite you to join us physically for both MobilizeThis2010 and the AUPOV2010 event which will follow. Could you please give me a call on the mobile to discuss – 0427996984.